Hello everyone. My name is Mat and I am a fuzzing addict. I can’t stop. I’m constantly doing it and craving that next fix. I need it. I’m addicted to the thrill ­of the hunt -- the anxiety and anticipation for my fuzzers to report a crashing condition. Sometimes that sense of euphoria comes in a matter of seconds. Sometimes hours. And sometimes not at all. And that’s when the withdrawal hits. Hard. So, what does a fuzzing junkie like me do in times like these? They start looking outside the realm of what is comfortable, looking for something to supplement (and even compliment) this addiction. For me this was Dharma. Dharma is a generation-based grammar fuzzer provided by Mozilla. It allows a user to define a template, known as a grammar file, then generate content for your pleasure. But how can this be used to give me that next hit? That next crashing condition? In order to get there, we first need to take a step back. Over the last few months, a lot of my work and research has been focused around Foxit Software, and with good reason. In 2018 Foxit took the number one spot for published advisories through the ZDI program. This is not only great for the vendor to help them with hardening their application, but it also allows us to see some interesting trends and techniques that researchers are using in their efforts as well. Let’s take a look at the proof-of-concept for ZDI-18-1157. This is a use-after-free in Foxit Reader using the createIcon() method of a document object and was discovered by Trend Micro researcher Kamlapati Choubey. 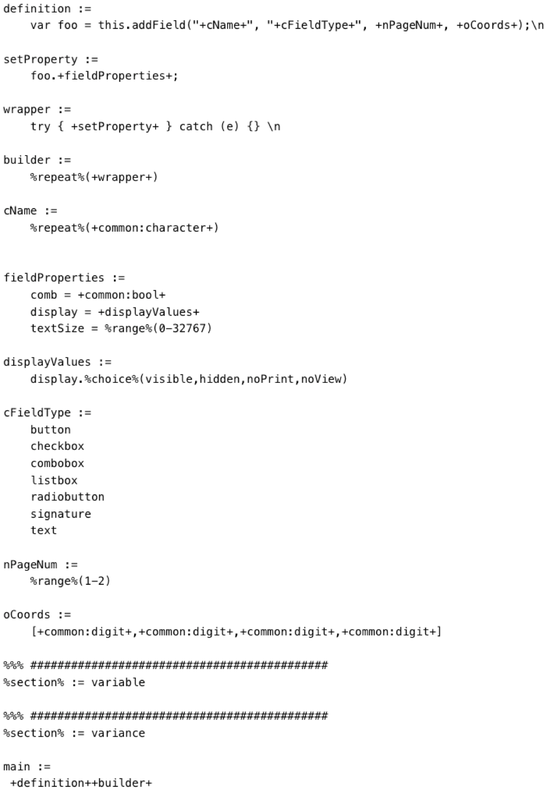 The code above defines the array arg1. Later, it defines a getter for the first item of the array with a callback function that executes app.activeDoc.closeDoc(). It’s worth noting that app.activeDoc.closeDoc() forces the Doc object to be freed. Finally, createIcon is called with arg1 being passed as the first argument. The createIcon function iterates through arg1 which triggers the getter once it iterates over the first element of arg1. If we look at the crash generated by this proof of concept, we can see that ECX points to a freed heap object being moved into EAX, which is immediately used in a call statement showing the possibility of remote code execution. So, using this proof-of-concept, how can Dharma help me find additional bugs using this logic? Our definition instructs Dharma to print “hello” and then fill in the blank with something from one of the values defined under stuff. According to the API documentation, addField() takes four parameters and returns a Field object. Here’s a description of these parameters from the Adobe documentation. Based off of that, we construct a quick, crude representation of that with Dharma. Last but not least, we need to specify our freed variable as a possible value in our template. 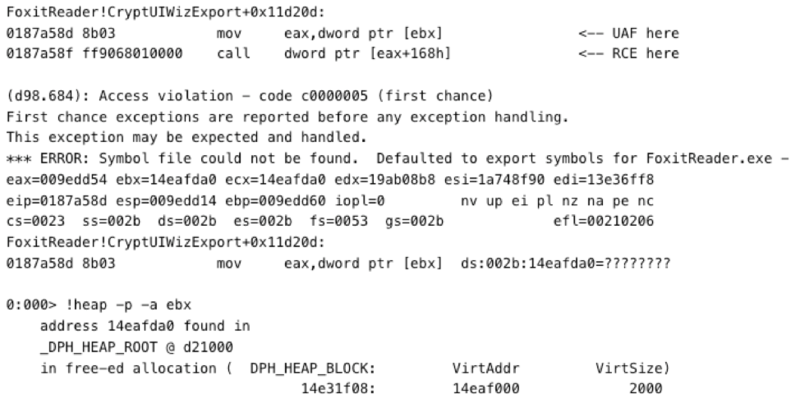 Taking a look at the crash, we can see that EBX references a freed heap object that is being placed into EAX and EAX is immediately used to execute a call instruction. Dharma is a powerful, grammar-based fuzzer that should be a welcome addition to any fuzzers toolkit. Using similar techniques with different templates I was able to shake a couple more bugs free and reported them to Foxit as ZDI-18-1183, ZDI-18-1162, and ZDI-18-1208. Please keep in mind the grammar file used in this example was gutted significantly for ease of reading, but the principals are the same. With such a tool at your disposal, what will you fuzz next? And if you find anything great, be sure to submit it to our program! You can find me on Twitter @mrpowell, and follow the team for the latest in exploit techniques and security patches.